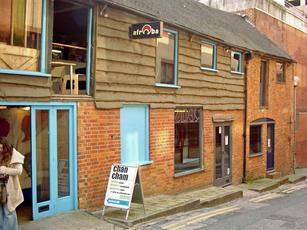 8 Merchants Place is now The Shed café - actually an old forge rather than a shed, they say. Lovely little bar with friendly bar staff, quirky music and furniture! Like the person below says, it would be better if the opening hours were extended somewhat, even if it was just on weekends as it becomes a sanctuary from the �unpleasants� you find in town on a Friday and Saturday night. The great atmosphere in the place will always keep me going back to Afro Bar. All in all, keep up the good work guys! This is a nice little bar tucked away from the usual Reading clientele. Its just off Friar street which is renowned for its drunken townies and �1.50 a pint Wetherspoon type places. This place seems to be in a different town let alone a different area and offers a bit of sanctuary. It is a very small place but in saying that you do always seem to get a seat. Its never too busy or too quiet, but just about right. Really nice atmosphere, kinda feel like you're in a friends front room, albeit a very, cool and trendy friends front room. They play excellent music which ranges from breakbeat to xen cuts style music. A definite must for those wanting to avoid the usual unpleasantness of the Friar Street hamptons. A few downsides are the beer, it only comes in bottles, no draughts, which i know for most is a big downside. As with all places that only sell bottles, its expensive for what you're getting. Also, in my opinion, it doesn't open late enough. I think it shuts at 11pm every night, normally the time I like to go there to get away from the hordes of Vicky Pollards. Saying that, if you fancy a beer from 7 til 11 and I don't mind paying a bit more its absolutely perfect. Staff are always friendly too. and happy to chat, especially about the music playing at the time. One of Readings few plus points as far as bars/pubs go. Another one being Cafe Iguana, although that gets very very crowded and busy later on. Woah!